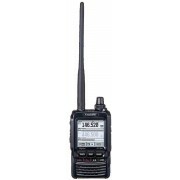 We are pleased to announce the new and advanced FT2DR C4FM/FM 144/430MHz Dual Band Digital Handheld Transceiver. This Exciting leading edge transceiver is designed with ease of use in mind with a full back-lit touch panel display. The 1.7-inch high resolution touch screen display provides loads of information through an easily navigatable interface, providing stress-free operability and a high level of on-screen visibility for the FT2DR operator. System Fusion features in the FT2DR to make it an ideal digital communication product for all Amateur Radio operators, such as (but not limited to): Snapshot with image data transmitting (requires MH-85A11U), Smart Navigation, Digital Group Monitor (GM) featuring position data and ID data transmitting during transmissions, and full support for the new and robust WiRES-X. The advanced FT2DR is loaded with various new features such as: 700mW of clear loud audio, Built- in High Sensitivity 66ch GPS with antenna, 1200 bps / 9600 bps APRS® function, Dual watch (V/V, U/U/, V/U), Dual Monitor (C4FM Digital/C4FM Digital), GPS Logging/Recording capabilities, Water resistant (IPX5 Rating), micro SD Card Slot, and 2200mAh high capacity Li-Ion battery.